VERSATILE & COMPACT PROJECTOR SYSTEM From office presentations to movies by the campfire, the Acer C200 puts business and entertainment in the palm of your hand. This mobile DLP projector can be used wherever the world may take you, and display a beautiful image on any surface. This versatile projector comes with a native 854 x 480 FWVGA resolution or at it's maximum can display at 1600 x 1200 to truly immerse you into movies or capture extra detail during presentations. Featuring a wireless dongle to use anywhere, you can enjoy full-length feature films as the Acer C200 has a renewable battery life of up to 4 hours. The LED lamp has an impressive lifespan of 20,000 hours, or 30,000 with Acer's EcoProjection feature, along with the ability to connect and charge your smartphone, with a quick-acting on/off feature so you can always be on the move. USE THE ACER C200 ANYTIME, ANYWHERE At just 350g and 120 x 110 mm, the Acer C200 is the perfect piece of kit for your travel needs, use it with complete ease at any time, whether you're camping in the wilderness or simply sitting at home. The Acer C200 is easy to set up and has a convenient immediate on/off functionality saving you valuable time especially if you're on the move. 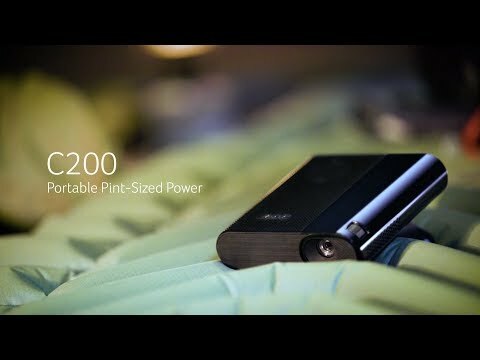 IMPRESSIVE VISUAL QUALITY IN A COMPACT FORM The easy-to-use Acer C200 projector lets you connect quickly and stress-free so you can project longer and wait less. The stunning LED lighting allows you to enjoy a wider colour gamut and has greater durability than traditional projector lamps. Your LED lamp has a life of up to 20,000 hours, and with Acer's intuitive EcoProjection™ technology you can extend your lamp life up to 30,000 hours while it reduces power consumption by up to 70%. INTUITIVE SMARTPHONE COMPATIBILITY Use the Acer C200 to charge your smartphone and project all your cherished photos, music and videos on the big screen with the convenient MHL® port. INCREDIBLE BATTERY LIFE Whether you're enjoying full-length feature films or perfecting a presentation, the Acer C200 will never let you down with its impressive 4 hours of renewable battery life. ACER WIRELESS PROJECTION TECHNOLOGY Project cable-free and break free from burdensome, unsightly cables and project with ease using the wireless dongle and utilize Acer's Wireless Projection, with which you can use your device to view content in a multitude of ways, such as quad view or through mirroring content through devices which are Android 4.2.2 or Windows 8.1 (or above) compatible.